Jackie Marks may be described by some as ‘a real character of the game’ but that would be doing him a great disservice. Jackie is known as being forthright and certainly not shy of voicing his opinion, but his opinion rightly holds more authority because of its grounding in his hard work to gain the knowledge & his experiences in the North East’s Non League game. In the 70’s he was the most sort after coach & managed many of the North East’s top Non League clubs, his achievements are second to none and the list of players he’s worked with reads like a who’s who of the regions Non League greats. A famous part of Blyth Spartans history is irrevocably linked to him but Jackie’s involvement with the club began some 10 years earlier in the summer of 1967 when he didn’t get the manager’s job having being personally asked by the Spartans Chairman to apply for the post !, those events summed up his sometimes-turbulent love affair with the club. “I was a skilful player, but in those days we could all trap a ball and pass a ball. “I was 19 and I went along on a Tuesday and Thursday nights but there were loads there and it was a bit chaotic. I did play a couple of games for the Reserves and a few for the 3rd Team but there wasn’t a lot of interest showed and I signed for Shankhouse”. “It was like a comedy film at first. You got the train, reported to the camp, went through a door into a hut and had your hair cut, then through another door where they stuck six needles in you!, but once it settled down it was the making of me. I was posted overseas and I captained the British Army team in Japan when I was on leave, not that I was the best in the army: the best players didn’t get posted!. I also spent a fortnight at battle school where all the ammunition was live, and I visited Hiroshima. They were tough experiences and by the time I got back to England I’d had enough of the army. I said I wouldn’t salute another officer, so they sent me on an exercise to Salisbury Plain for the last three weeks of my time to keep me out-of-the-way. “We met when I was 15 at High Pit pictures and we were engaged before I joined up. That place was Newburn FC who were a top side in the strong Northern Alliance. 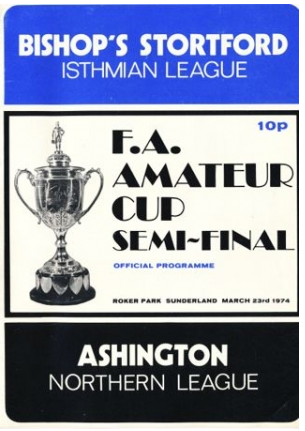 Newburn, who also had Peter Feenan’s father in their ranks, lost the game 2-1 but the following week they gained revenge by beating them 3-1 in the Final of the Northern Alliance Challenge Cup, which was a notable achievement as Ashington was a professional club at the time. Jack had a spell at Whitley Bay where he played in their very first Northern League game against Durham City in 1958, now in his late thirties and beginning to turn his attention away from the playing side of the game towards coaching. His final fling as a player came when he went with a friend who was having a trial for Ponteland United. Bobby Cowell, who won three FA Cup winners’ medals with Newcastle United in the 1950’s, managed the team and Jack turned out because they were short of players. He stayed for the whole season, scoring 34 goals as a centre forward before hanging up his boots and taking his coaching badges. Jackie, back row 4th from left, at the FA Coaching course. Alan Brown and Stan Calvert, coaching gurus at Newcastle University, took him through his preliminary badges before he completed his full badge at Houghall College in Durham. It was while managing Gosforth and Coxlodge that Blyth Spartans entered Jackie’s life, Blyth had found life in the Northern League tough finishing bottom in their first season in 1964/65, but had gradually improved season on season and in 1966/67 finished a respectable 9th place finish. 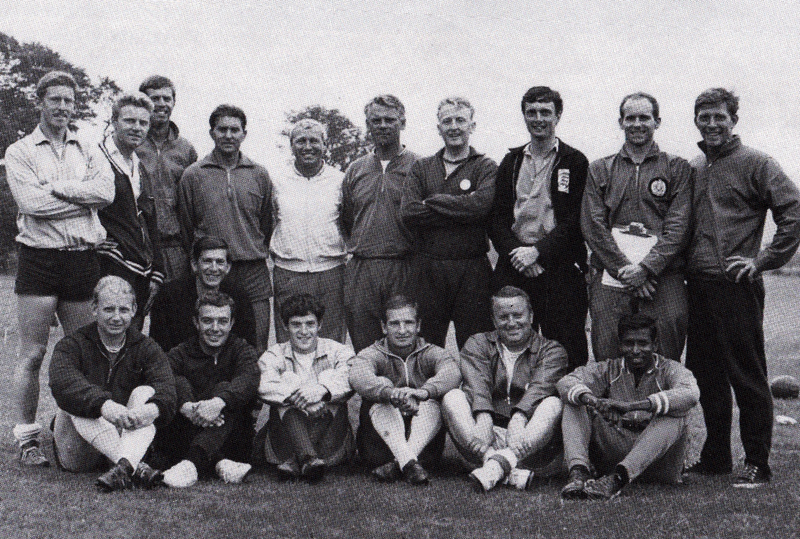 This rare 1967 team photo show Jackie shortly after taken charge. It features future Manager Peter Feenan, (front row centre) and the late great Ronnie Scott (back row 5th from left). Jackie steadied the ship and the Spartans finished 1967-68 season 8th in the league. The basis of a good side was there and Jack built upon it, things progressed well for the next two seasons as Blyth finished 5th in 1968/69 and the following season came within 5 points of winning the league finishing 3rd . “When I took the job in the first place I did so on the basis that I didn’t want any money until I had proved myself, and I accepted ten shillings a week. After a couple of seasons I felt justified in asking if it could be reviewed; I was out-of-pocket, what with scouting and traveling, and we were top of the league with four games to play. Turney said I might as well leave straight away because I had done nowt for the club! I made him come into the dressing room and repeat what he had told me in front of the players. They were in revolt and Turney tried all ways to make amends but I stuck to my guns. My pride was involved”. Jackie was replaced in the Croft Park hot seat by another young coach in the form of Allan Jones but he wasn’t out of the game long next club as high-flying Northern League club Tow Law Town came calling. Having finished 3rd in 67/68 & 68/69 the Lawyers had fallen to 9th the following season and were looking to get back up with the title chasing sides, Jackie was recruited by Chairman Harry Hodgson and Secretary Bernard Fairbairn to do just that. In his first season his Lawyers side that included established players such as Tommy Pickford, Dickie Longstaff, Jimmy Leach and Terry Hunt. 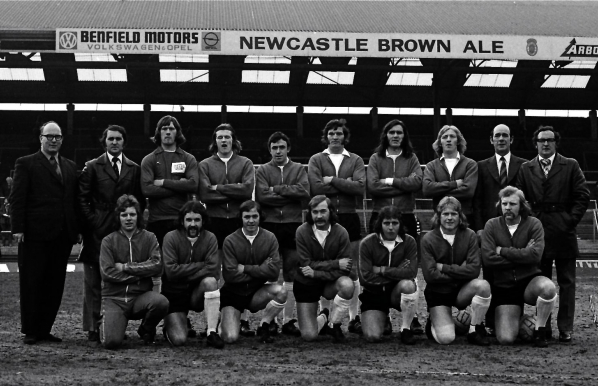 The high point of the campaign was taken eventual FA Amateur Cup winners Skelmersdale United to a repaly, the Lancashire side included Steve Heighway, who went on to stardom with Liverpool, and Micky Burns whose career included a very successful spell at Newcastle United. Jackie’s side were the only club to give Skelmersdale a fright that season in the Amateur Cup drawing at the Ironworks to a 1-1 draw before losing the replay 0-1 to a side who then easily beat Wycombe Wanders 3-0 in the Quarter Finals and Leatherhead 3-0 in the Semi Final on their way to winning the trophy by beating Dagenham 4-1 at Wembley. 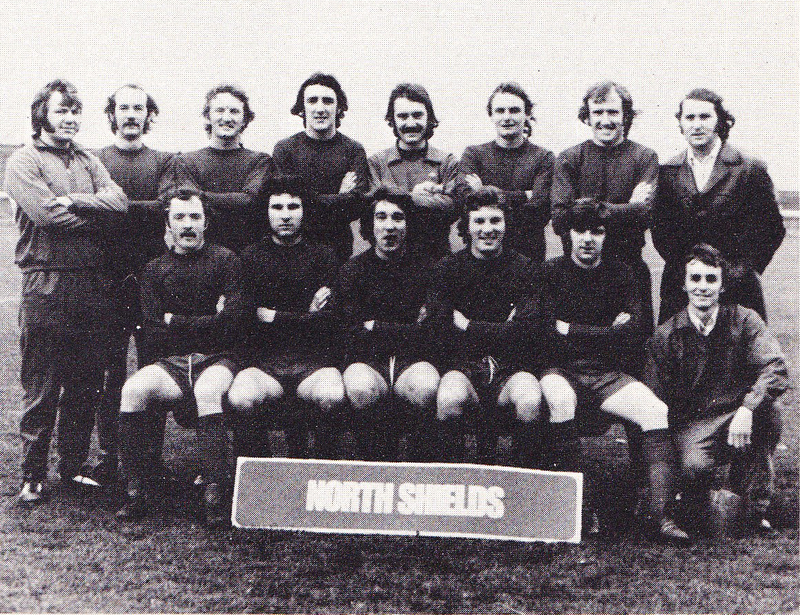 The rest of their season didn’t quite match that level once again finishing 9th and crashing out of the FA Cup 0-3 at local rivals and eventual league champions Evenwood, (they were managed by Billy Bell who having guided Evenwood to 2 successive titles would become the Blyth manager August 1972). “I thought it might be a bit too cosy at Spennymoor as they were a very successful side while Ashington were struggling, so I decided to go there. 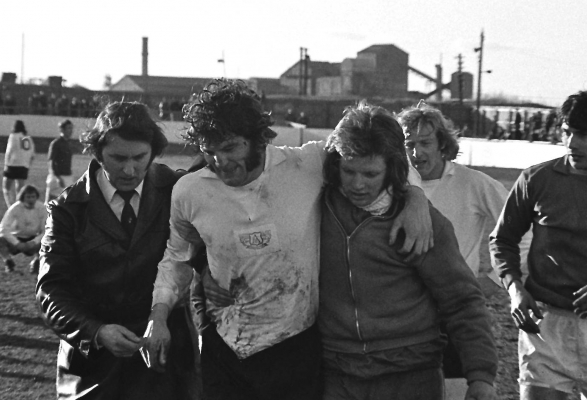 Within a season-and-a-half Jackie had Ashington back on their feet, having joined t he Northern League in 1970/71 and finished 11th they then struggled and finished 3rd bottom the following season, a 9th place finish was achieved in 1972/73 and 1973/74 was there best so far in the Northern League. He took the Colliers to the Final of the League Cup (losing to his former club Tow Law 1-2 in the Final) guided them to 8th in the league and more impressively to the Semi Finals of the Amateur Cup, losing a replay to eventual winners Bishop’s Stortford 0-3 at Griffin Park Brentford having drawn the first game 0-0 at Roker Park. Jackie helps the inured Billy Wright from the Portland Park pitch. 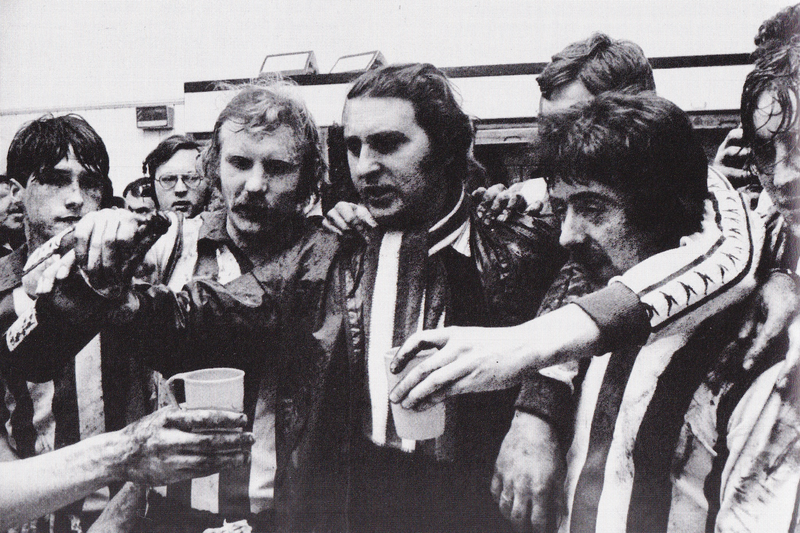 “Billy was the icing on the cake. Things weren’t going well for him at Whitley and I told him if he signed for me he would never be out of the team. 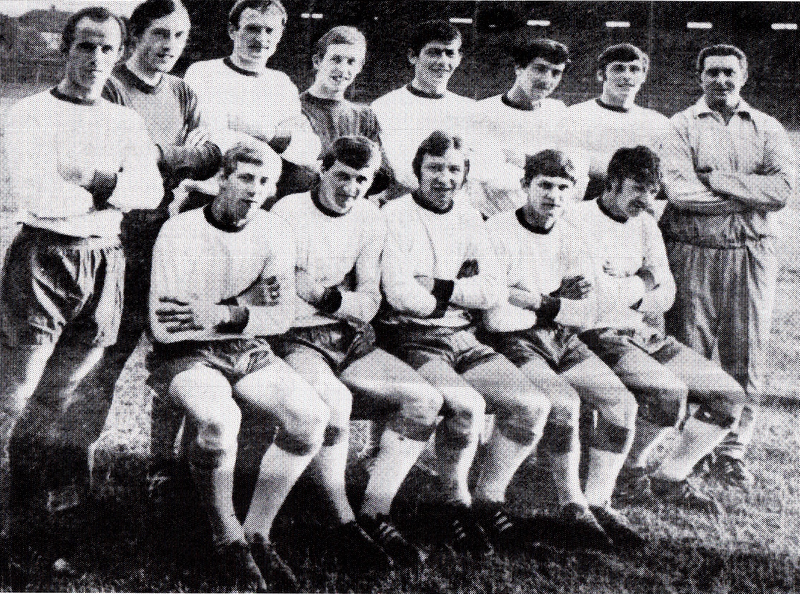 Jackie Colliers side pictured before kick off at Roker Park includes future Spartans Tommy Dixon (far right front row) & Les Mutrie (4th right back row). “We had two great games against Slough. They had been in the Final the previous year and they thought they were going to win it. The manager of the Holiday Inn down there invited us for free food and drink as a gesture of goodwill, but the players were so greedy he had to close the bar and stop the food after 20 minutes! We drew down there and when we found out that the bookies has us at 7-1 to win the replay we sent this kid to the bookies with the money to bet on ourselves. We won 1-0 and the Slough players didn’t like it. “After the Semi-Final we played North Shields in the Senior Cup. We drew the first game 2-2 even though George Courtney the referee played nine minutes over and I threatened to report him!. In the replay at their place Billy Scott was sent off after 15 minutes but we still beat them 2-0. Ray Wilkie was their manager and he said he thought there was a herd of elephants in our dressing-room we, made so much racket. Despite the good times things turned sour for Jackie at Portland Park and he fell out with certain members of the Colliers board and he quit but he wasn’t out of the game long North Shields were in need of a new manager after the departure of Ray Wilkie and they persuaded him to take charge at Appleby Park in June 1974. Once again Jackie saw taking charge at North Shields his kind of challenge and with the Robins Amateur Cup winner Ronnie Tatum as his assistant they went about rebuilding the side. However his relationship with new Chairman Len Murphy, who was only appointed in October was not a smooth one. Murphy wanted an improvement after Jackie achieved an 8th placed finish in his first season, 2 places lower than before he took over but Jackie was building for the future. Including future Spartans Keith Houghton (front row 2nd left) & Rob Carney (front row far right). “Jimmy came to see me at work and said he wanted me to be coach at Blyth and I had to take the job because he had already given the manager’s job to someone but what he didn’t know as that it depended on me being his coach!”. 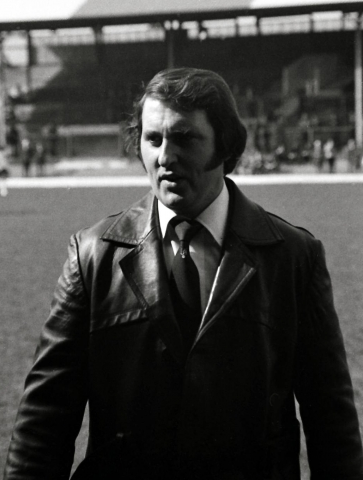 After 2½ years in charge winning the League title in both seasons Alan O’Neill quit in February 1977 and after a fortnight of discussions Turney had formulated a plan that was to transform the clubs history, the manager that had been appointed was none other than Jackie’s shrewd signing from South Shields back in 1969, a striker who had gone on to become one of the clubs all time leading goal scorers and crowd favourite: Brian Slane. Slane & Marks saw out the season as Blyth finished 5th their lowest finish in 6 seasons, the first task Jackie identified that summer was to improve the team’s fitness levels and Jack was a hard taskmaster, but his methods paid off. They set about rebuilding the Blyth side and pulled off some key signings in the form of goalkeeper Dave Clarke from Gateshead, and added significant Football League experience with signings of 1973 FA Cup winner Ron Guthrie & Terry Johnson. Both had become disenchanted with League football, surprisingly Guthrie had been allowed to leave Sunderland by Bob Stokoe then played briefly for Ashington & Gateshead before a spell in Petoria, South Africa with Arcadia Shepherds. Upon returning to the North East Jackie swooped for the left back’s services, Terry Johnson likewise had returned ‘home’ having become home sick at Brentford. Johnson had joined Southend United in January 1971 from Newcastle United having never figured for his hometown club and went on to make 157 appearances scoring 35 goals and won the Shrimpers 1972/73 Player of the Year award, Brentford swooped to sign Johnson for £10,000 in 1975. 101 games and 27 goals later Terry had become homesick and wanted a return to his native North East but a wage dispute with the Griffin Park club led to him being unable to play League Football, once again Jackie shrewdly signed up Johnson to play for the Spartans and it proved a masterstroke. Not only had he the contacts and ability to pull off the coup’s like Guthrie & Johnson he also showed his knowledge of the local football by signing up Blyth lad Steve Jones after watching him playing Sunday football in Blyth for the Golden Eagle Pub and being impressed with his blistering pace. The second round brought Arthur Cox’s Chesterfield to the Northumberland coast and Slane & Mark’s philosophy of attacking football surprised the league side and they more than matched Cox’s league side for fitness allied with the experience in the Blyth side a 1-0 victory wasn’t seen as an upset by anybody within the club. The club was one a roll and Chairman Jim Turney backed his management team as they further improved the squad with the signing of Bishop Auckland striker Alan Shoulder and midfielder Keith Houghton from Jackie’s former club North Shields. “We beat them 1-0 and Alan Shoulder scored. He stood five feet four and jumped ten feet high; he was the hardest little man I’ve met in my life”. Being as methodical as ever Jackie was determined to be more ready than ever for the biggest game of all of their lives and with the help of Tyne Tees Television, who made available video footage of Stoke in action, the Spartans were well prepared. However the first game scheduled for 28th January was called off an hour before kick-off because of flooding, the pitch was still unfit for the re-arranged tie on the following Monday night. “When I heard the result I thought ‘Let’s gan and beat them — I honestly thought we were going to Wembley. We travelled to Wrexham on the Friday night and it was so frosty we trained on the hotel car park; Barry Davies the BBC commentator joined in the five-a-side. The game was played on a rock hard frosty pitch, which at least justified the car park training session it was claimed had it not been for the BBC Match of the Day camera’s being present and the distances traveled by the amount of Blyth fans the game wouldn’t have gone ahead !. Famously, all wearing trainers, Blyth led 1-0 through a Terry Johnson goal until a controversial corner kick in the dying minutes of the game allowed Wrexham to score their infamous equalizer, only after the corner was taken 3 times due to a corner flag fallen over!. Jackie was disappointed to concede the late goal but proud but happy to have earned the draw which brought the Welshmen back to the North-East. Barry Davies interviewed Jackie after the game for Match of the Day, and when the team called at a pub in Chester on the journey home the interview was going out on TV the landlady recognised Jack and they had a lock-in until two o’clock in the morning! The fairytale end on a rain-soaked night at a packed St James Park, come the final whistle it proved too much for Jackie who broke down in tears as the team did a well-earned lap of honour. 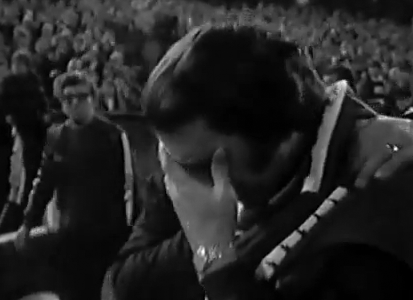 When interviewed after the game it prompted him to make his famous statement that: ‘it was only the 2nd time in his life that he’d cried’ (the other being after Ashington’s Semi Final defeat in the Amateur Cup). 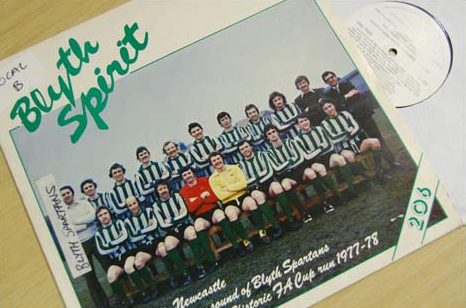 The tears were captured on camera and the sound bite immortalized on the commemorative ‘Blyth Spirit’ LP that was released by BBC Newcastle after the cup run. Glum faces as they toast their historic achievement in changing room at St James Park. “I was gutted, but proud that a bunch of local lads had given people something to enjoy. One bloke I know once told me the two most memorable events in his life were his wedding day and seeing Blyth play Wrexham. People know me and know Blyth Spartans everywhere because of what happened. A footnote to those events showed how ‘tight’ a ship Jackie maintained when it came to light that the Carney brothers, who both played at St James Park that night, weren’t paid for their efforts. Steve and Rob had turned up for final training session before the game still drunk from Steve’s bachelor party the previous night, and apparently even appeals from the Wrexham players failed to persuade Jack to change the rules!. Blyth ended the 1977/78 winning the Northumberland Senior Cup, the League Cup and the Debenhams Cup, by October 1978 manager Brian Slane stepped down and Jackie had no hesitation taken over the manager’s job. Jackie stayed on as manager for another highly successful 3 years, winning back-to-back Northern League titles in 1979/80 & 1980/81 and landing the Northumberland Senior Cup and of course his cup pedigree brought more famous cup runs. Showing the standards Jackie had set and the levels of expectations from his sides an FA Trophy Quarter Final defeat to eventual winners Mossley after a replay in 1979/80 was a major set back because the club really thought Wembley was within reach. 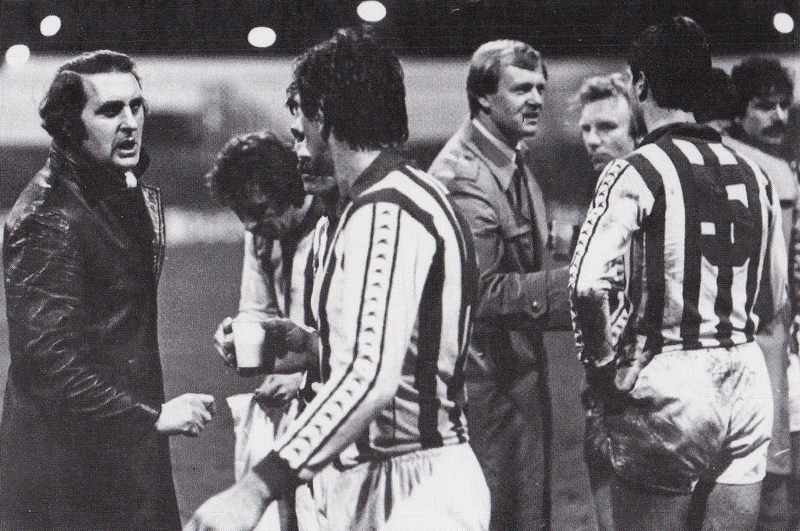 Jackie & coach Gary Moore rally the players during the break before extra time at Elland Road. The FA Cup brought league sides Mansfield & Walsall to Croft Park and likewise respective 0-2 and 0-1 defeats were also seen as big disappointments, but 1980/81 saw Jackie’s side were more than a match for Division Three side Hull City. It took to 3 games to separate the sides with Blyth losing 1-2 at Elland Road after extra time. 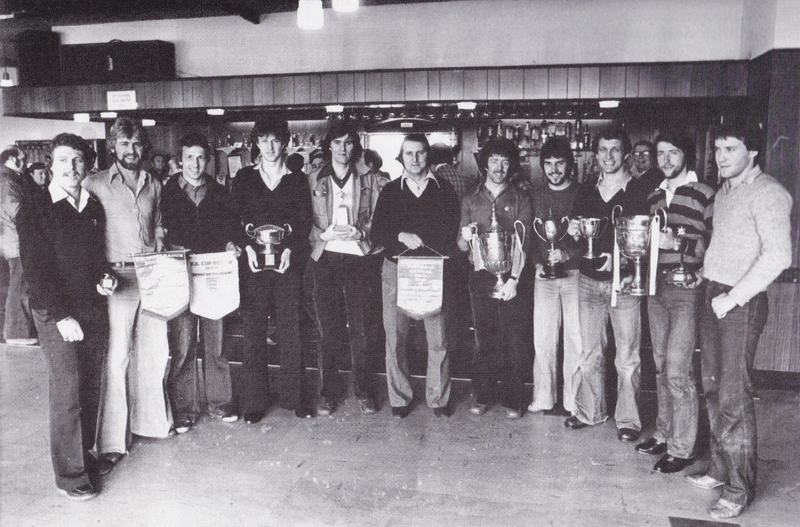 Jackie and his player proudly show off their awards in the social club. Jackie continued to bring some top quality footballers to Croft Park during his 3 years in charge, the likes of Paul Walker, Dave Mitchinson, Alan Walker & Geoff Hart. It was Jackie who brought midfielder Harry Dunn to Croft Park in August 1981 and we all know what he went on to do for the club!, but of all the top quality players he brought in during his years with the club it was the 1979 signing Les Mutrie from Gateshead he classes as his best. “When I signed Les Mutrie from Gateshead Jimmy Tumey saw him once and wanted to call an emergency board meeting. He claimed Les was the worst player ever to sign for Blyth, yet 18 months later he sold him to Hull City for £30,000!”. 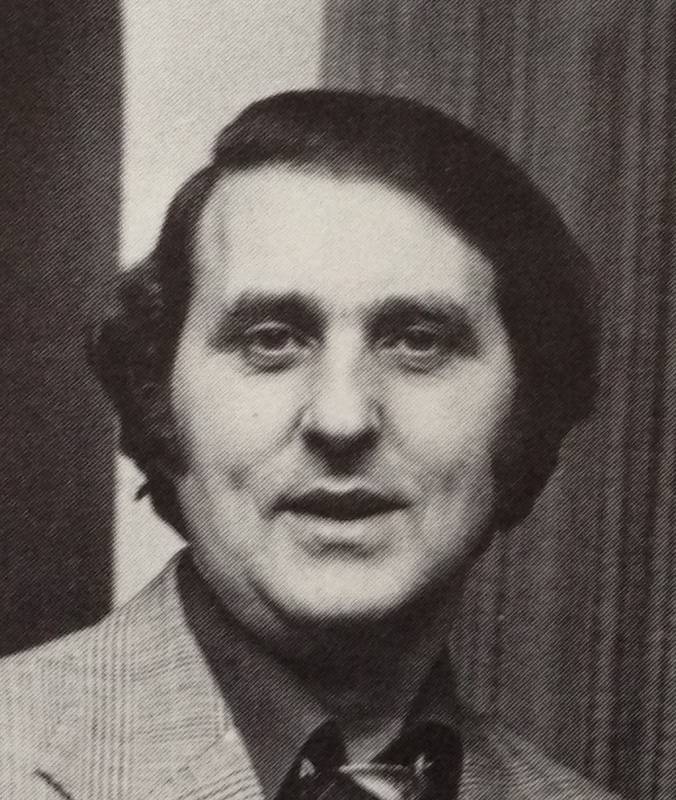 Jackie stepped down as team manager in May 1981 and was replaced by former North Shields manager Bobby Elwell but stayed on at the club as General Manager for another 4 years. It was probably no surprise the way Jack’s official ties with the club were finally cut, in November 1985 his tempestuous relationship with Chairman Jim Turney brought his association with ‘his’ club to an end. “Jack we’ve been friends for many years and I’m trying to help you and advise you”. “It was at that point I stopped the Chairman in his tracks and said that the solution would be for me to resign and for the club to transfer the player. I found it incredible to be told that the fans at Blyth were against me and the way after the chairman’s comments, I informed him there is no way I would come back to Croft Park in an official capacity – unless it was as a manager of another team!”. “I will return, as spectator. I’ll watch Blyth Spartans because I love the club”. As to be expected he was true to his word and to this day now aged 82, he can be still found standing among the Croft Park faithful on the terraces at every Spartans home game. Jackie enjoys meeting up with his old players & friends at Blyth games (LtoR – George Watson, Johnny Evans, Billy Fenwick, Mickey Lister, Ronnie Phillipson, Eddie Alder, Gordon Atkinson). he’s not a footballer….he’s a decent player….it’s not in his nature to not have an opinion. Jackie, now an Honorary Life Member of the club, rightly deserves of his place in Blyth Spartans folklore. Jackie Marks himself for helping with this article. Chris Sanderson who provided images and info on Jackies’ early career. Chris is now living in Paisley and reports on Scottish football but was born in Ashington and grew up watching Jackie’s Ashington sides. Ashington AFC website for allowing use of photo’s from Jackie’s time at the club. Images taken from the superb collection of old photo’s taken by then club photographer Mel Morpeth. Ken Sproat the oracle on Blyth Spartans history pointed out & helped ironing out some factual errors. We Love Football, a book about local Non League Football by Barry Hindson. It featured a section on Jackie from which some info & images were used. Alisdair Gibbs-Barton, for all his genealogy research & help confirming dates. This entry was posted in Blyth Spartans AFC, Green & White Cult Heroes, Managers, Uncategorized and tagged Ashington FC, Barry Hindson, Billy Linacre, Blyth Spartans AFC, Brian Slane, Croft Park, FA Amateur Cup, FA Cup, Green & White Cult Heroes, Harry Dunn, Hull City, Jackie Marks, Jimmy Turney, Keith Houghton, Le Mutrie, Non League Football, North Shields FC, Northern League, Portland Park, Roker Park, St James Park, Tow Law Town FC, We Love Football, Wrexham Football Club. Bookmark the permalink. I worked for Jackie at Winthrop and he was a great boss to work for straight talking but he made me laugh.